Ahhhh….sweet, sweet June. The month when summer officially arrives, but the high summer temps and humidity haven’t set in yet. The month when sitting on the back porch is a pleasure to be enjoyed any time of day instead of something reserved for the early, early morning or later night hours when it’s cool enough. It’s the month of vacations and family cookouts. Summer is definitely my favorite season, but June just might be my favorite month of the year! 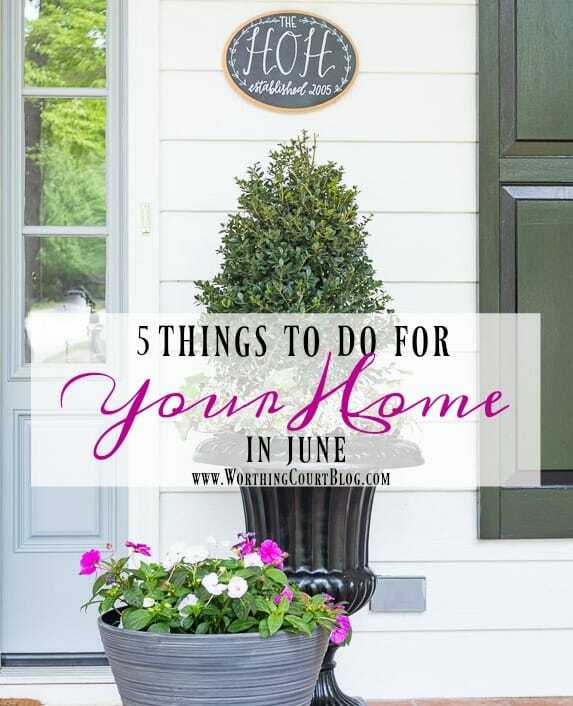 I want to make sure that I completely and fully enjoy my summer, so here are 5 things that I’ll be taking care of this month! The weather is mild enough here in NC that we can cook on the grill year round if we really want to. But – there’s just something special about firing up that grill for summer gatherings of family and friends! 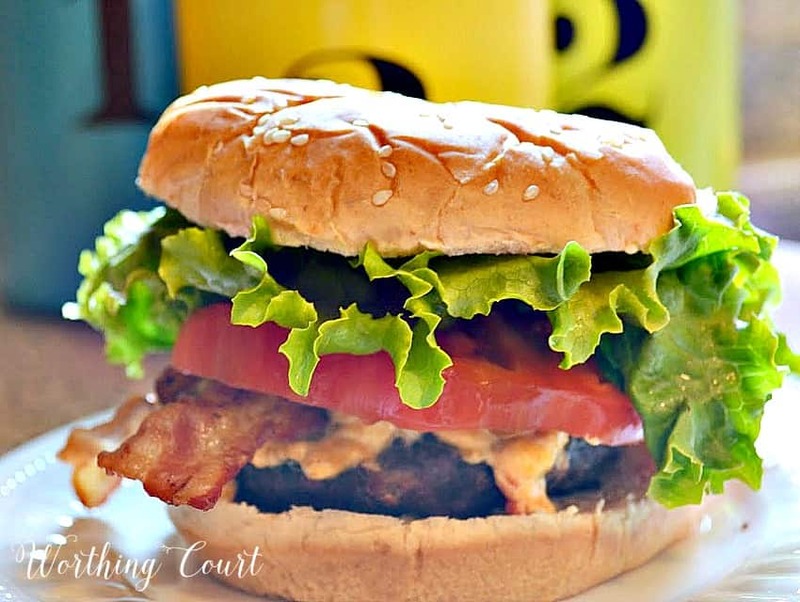 I think we all have our own ways of grilling our burgers, but this recipe is one of my favorites! TIP: For juicy grilled burgers, form ground chuck loosely into a 3/4″ thick patty and make a deep depression in the center of the burger with your thumb. The depression magically disappears as the burger cooks and gets rid of the need to press the burger with a spatula to flatten it out, which gets rid of a lot of the natural juices and leaves you with a dried out burger. Speaking of cooking on the grill, I’m willing to bet that July 4th falls right in there with Memorial Day and Labor Day for being one of the most popular days of the year to cook out. I love to go all out with my patriotic decorations and table setting for those events on our screen porch! I sprinkled greens and blues throughout my home for the summer. 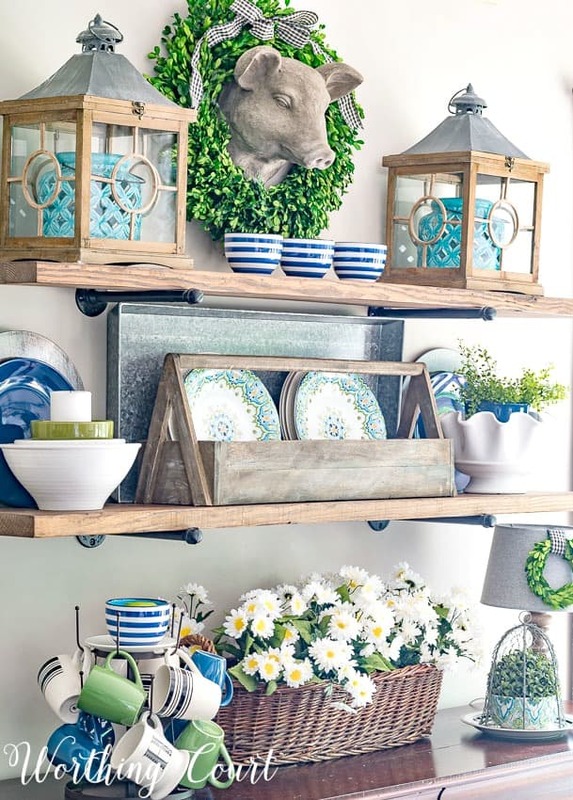 The greenery serves to bring the outdoors in and all of the different shades of blue make me think of cooling off in a refreshing pool. Now that you’ve gone to the trouble and expense of filling your yard and planters with gorgeous flowers, don’t forget to water! It’s an easy task for me to forget to do though. I’ve been know to let more than one plant go without water for too long. 🙁 We’ve added loads of new plants and shrubs to our house since we purchased it and I’ve found that the best way for me to keep up with all the watering needs is to wind soaker hoses around the plants and attach the hose to a timer on my faucet. Works like a charm. For my containers I actually have to make myself notes on my daily calendar or I totally forget! Do have a monthly to-do list for June? Do tell – what’s on it? 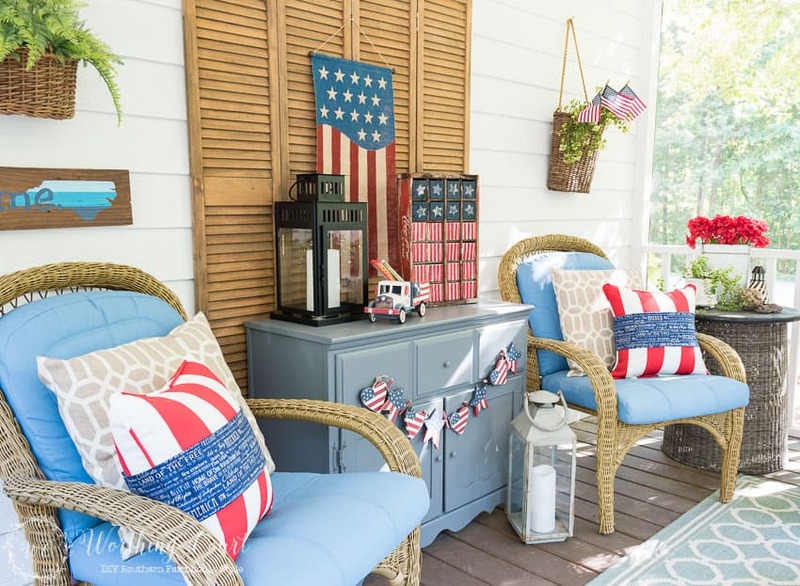 Your summer home is a patriotic, beautiful and peaceful space. Enjoy summer! Love the June to-do list … a great way to start the off a pleasant and enjoyable summer season!! My June list is long and I’m behind! My garden is lacking several things I usually plant–rain in my town has gotten my calendar out of whack!! Thanks for the handy tips!! 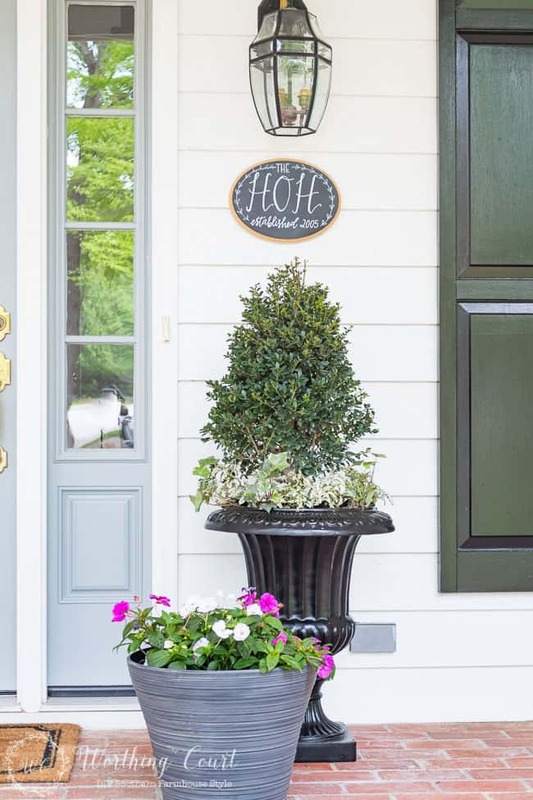 Love your “Americana” summer porch! So much to do for summer. I have to get my flower beds in order and take care to keep the deer from eating them! I live in Illinois and I try to have everything planted by Memorial Day. As soon as the yard, patios and decks are finished plus the porches then I’m on to washing all the windows so they sparkle when I enjoy my gardens from inside June is always like a whirlwind. Making lists is my godsend. Thanks fo your tips! One of the first things I do in Spring is to sweep and spray my front porch clean. Thanks for your Spring tips! Great ideas! Especially the outdoor grilling! Love to do that! The humidity is here in Wildwood, so getting out in the morning and tending to any gardening and filling the bird feeders while enjoying a nice breeze is my way to enjoy June. 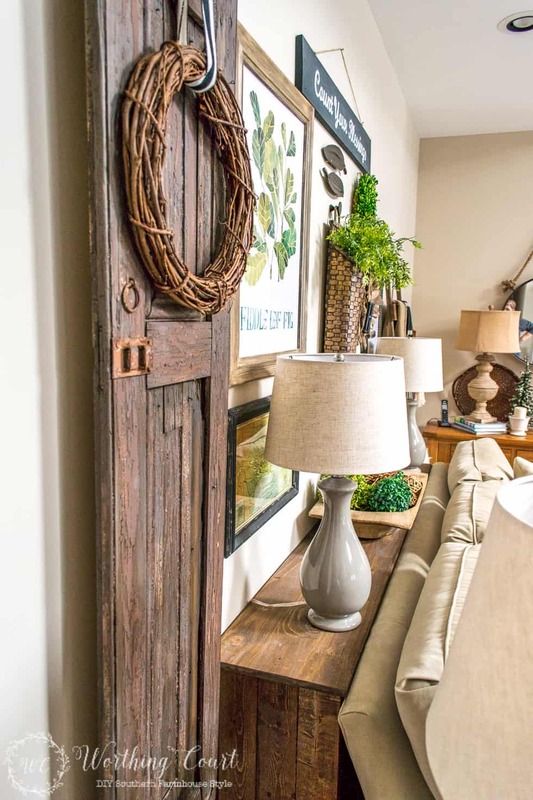 I love that you just add touches of different color to change the look of the season. Inspiring! Here in Wisconsin we have been enjoying beautiful, warm days with low humidity. Perfect for enjoying time outdoors. That is going to change this weekend when we get into the 90’swith high humidity. I better hurry up and get some outdoor projects done! You have put me in the patriotic spirit! I’m going all out this year. Now on to new plants – thanks for the reminder! Great tips for summer! One thing I am trying to do is mulch my vegetable and flower gardens so I don’t have so much weeding to do in the heat of July and August and can enjoy my summer more. I live in such a dry climate I water my outdoor plants every other day. It’s not hard for me to remember as I am out in the backyard every single day. Need to start a patriotic cross stitch project. Seeing your porch reminded me to get started or I won’t finish in time. I’m ready for the 4th of July and all the celebrations. Thanks for your tips! Love your posts. Goof ideas and beautiful look, love it all! Great list, Suzy! I love the burger tip. Never knew that one. Love the blue that you have in the kitchen/dining room.